Merry Christmas and Happy Holidays Everybody! 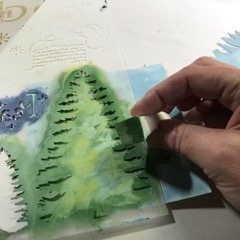 I’m so excited have this opportunity to be on StencilGirl Talk today to share a special holiday Infinity Flip with you. 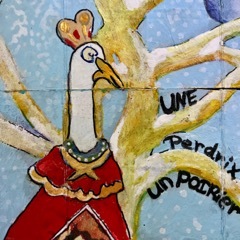 et une perdrix dans une poirier. Today, December 21, 2017 is also Winter Solstice, or Yule. So I couldn't help but include a nod to the longest night of the year in one of the panels. Can you find it? 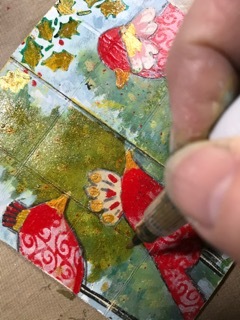 I started by arranging the large and the small tree masks from the Christmas #1 stencil by June Pfaff Daley on a 5” square piece of 90#, gessoed mixed media paper. Then I sponged light blue acrylic paint around the masks to fill in the background. 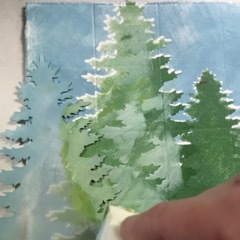 I let it dry and then replaced the tree masks with the tree stencils and pounced dark green acrylic paint through the stencil with a makeup sponge. 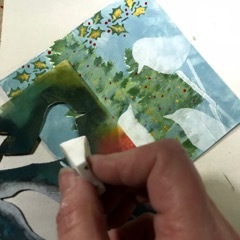 Next I arranged the large tree mask towards the outside edge of the tree on a slight angle and gently wiped upwards using an almost dry makeup sponge and acrylic paint in hues of greens and blues. 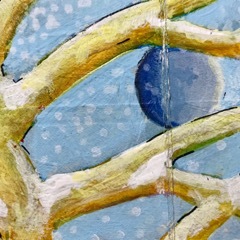 I worked from the outside of each tree into the middle, continually moving the mask to create branches here and there. I put the stencil back in place and darkened up the edge of the branches with the darkest green paint. 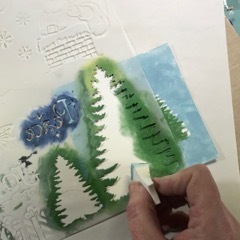 I used the masks again to protect the trees while I stenciled a holly border along the top. 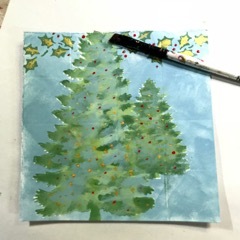 I painted the holly leaves gold and added a splash of color on the trees with dots of red, white, and gold applied with the with the tip of my paint brush. 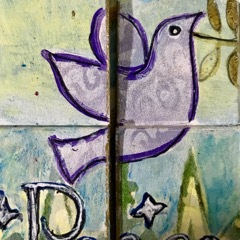 Time to add my birds…. 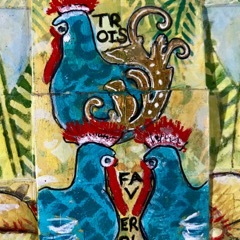 I applied gesso with a makeup sponge through the Tall Birds stencil. I’m a sucker for patterns and decided at the last minute to add some in the background. 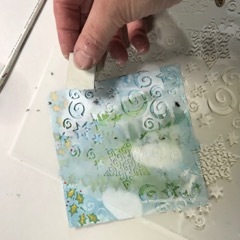 So, back on went the protective tree masks while I added some whimsical designs from the 6 Point Starry Night Stencil with a makeup sponge and gesso. 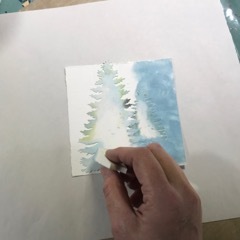 (In retrospect, I should have done this step before stenciling in the trees, but no worries; as my Mom used to say. “It all comes out in the wash”.) 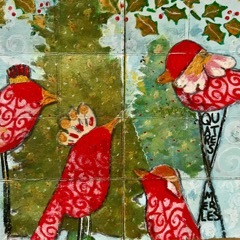 Then I painted out my birds in red and I used a star pattern from the 6 Point Starry Night stencil as feathers. 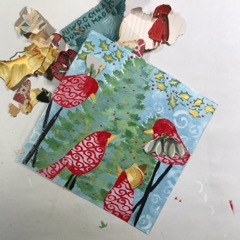 I fashioned hats and scarves for my four feathered friends from tiny pieces of vintage wallpaper scraps and then glued them on with matte medium. 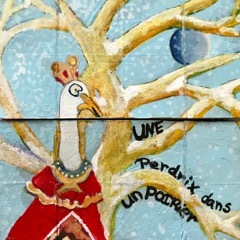 And then finally, I added the French text with a marker and used a Wink of Stella Brush for gold sparkle followed by a few coats of Satin Glazing Liquid. The glazing liquid adds both depth and protection since it will be handled frequently. 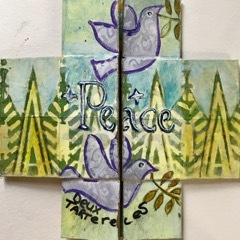 Feeling Groovy 4" x 4"
Winter Solstice 6" x 6"
Happy Holidays, Everyone! Stop by my blog anytime to visit! Jill, I just love this!!! Made me instantly think MB Shaw's Stencilclub set, June 2016... I think that's the month,anyways the birds would be awesome for this too. Now I want to make one! Love your idea. Thanks for reminding us about these Infinity Flip, Jill. I have to make one. 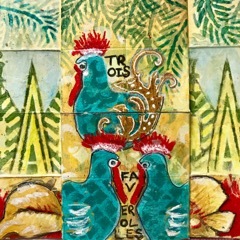 They are so seriously cool, kind of like a little album and a puzzle all in one! This is such. A fantastic card ! Wonderfully creative and beautifully designed and executed!